Tall buildings can add a great deal, but they also have their limits. A growing chorus of urbanists suggest that America’s cities may very well need more skyscrapers. Tall towers, they argue, could add the density needed to help cure steep housing costs and gaping inequality in cities like New York and San Francisco. Others add that dense concentrations of tall buildings could help make urban centers greener and more energy efficient than sprawling suburbs. A new study by Markus Schläpfer and Luís M. A. Bettencourt of the Santa Fe Institute and Joey Lee of the University of British Columbia takes a closer look at the connection between skyscrapers and cities. To do so, it assembles a detailed database of the height and shape of some 4.8 million buildings across a dozen North American cities: New York, Chicago, Los Angeles, Boston, San Francisco, Portland, Austin, Ann Arbor, Bellingham, and Santa Fe in the U.S., and Toronto and Vancouver in Canada. The table below, from the study, lists the average and maximum building heights for these 12 cities. (The authors note that the values for average building height are estimated based on the land area of cities, which vary considerably. One must also note that the raw data for building heights was collected at different times, and may not reflect new construction.) Still, the results are surprising. San Francisco (notorious lately for its land use restrictions and “nimbyism”) has the largest average building height of all: 9.7 meters, which is roughly 32 feet or three stories. Boston is next, followed by New York in third place with an average height of 8.4 meters or roughly two and half stories. Austin is fourth. In fifth place, Vancouver tops Toronto, which is tied for sixth with L.A. and Ann Arbor. Even more surprisingly, the average height of buildings in Chicago—with its impressive skyline and nearly 1,500-feet-tall Willis Tower—is just 4.8 meters or one and a half stories, about the same as Portland, Oregon. But average height is just one part of the picture. L.A., after all, is the densest city in the country (in terms of overall density), but New York is far denser at its core. A city can have a relatively tall average building height and still not have a lot of supertall buildings. To get at this, the maps below show the distribution of buildings by height for six U.S. cities. New York and Boston have far more tall buildings in and around their urban core. Chicago and L.A. have spikes of tall buildings, while Portland and Santa Fe have even less. Generally speaking, the study finds a connection between the size of cities and the height of buildings near their downtown cores. The graph below depicts this linear relationship, charting only those buildings within two kilometers of a city center. See how the line slopes upward and to the right, indicating a positive relationship. (The study points out that individual supertall buildings like New York’s Empire State Building or Chicago’s Willis Tower do not skew this correlation.) New York and Chicago now lead the pack in the upper right hand corner of the graph, with considerable concentrations of very tall buildings in their downtown cores. Toronto, Boston, and San Francisco are close behind. L.A. falls below the line, indicating that it has fewer tall buildings in and around its downtown than its size would suggest. The connection between the size of cities and the concentration of tall buildings at their core makes intuitive sense, seeing as large, dense cities frequently depend on transit to move large numbers of workers into their downtown business districts. A city’s density is also connected to the height of buildings. The chart below graphs the relationship between the two for six U.S. cities. Not surprisingly, the peak of the curves for larger cities like New York and Boston are shifted toward the right, indicating the connection between density and taller buildings, while the curves for smaller cities peak to the left. 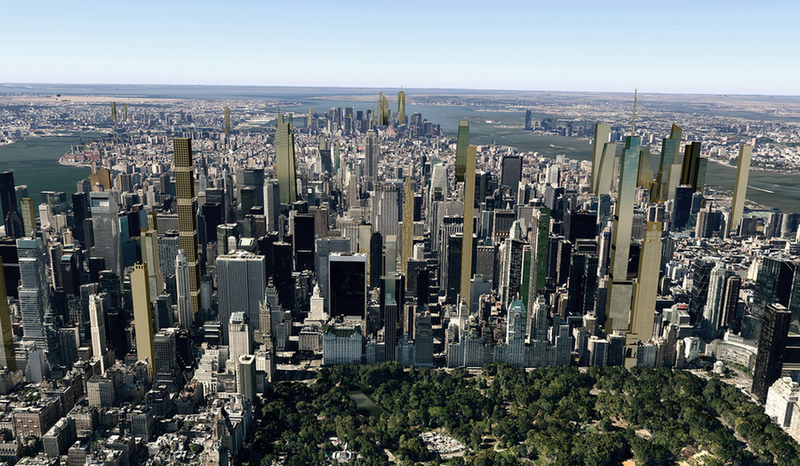 While tall buildings can be good for cities, they are by no means a cure-all. For one, skyscraper “canyons” found in Asia’s cities can create a type of vertical sprawl that suppresses the innovation that comes from street-level interaction. The most innovative districts in the world remain older industrial neighborhoods, such as Chelsea and Tribeca in Lower Manhattan, Cambridge (near M.I.T.) and parts of Boston, and areas adjacent to downtown San Francisco. These areas boast an abundance of mid-rise, open-floor plan, historic buildings that create street-level interaction, where people and ideas can combine and recombine to form new innovations and startup companies. Except for people afraid of heights, no one has any reason to worry about the coming wave of new towers. What’s more, the new skyscrapers being built in New York and elsewhere have increasingly become places where the world’s super-rich park their money. Perhaps the best example is New York’s 432 Park Avenue, the tallest residential tower in the Western Hemisphere, which was completed last year. These skyscrapers are fetching record prices as trophy properties for the one percent. “If buildings get too tall, construction costs become high, making floor space more expensive,” Bettencourt notes. Their infrequent occupancy also contributes to the dull, lights-out neighborhoods that dampen urban creativity and innovation. “You can read the intensity of socioeconomic life from a city’s skyline,” Bettencourt adds. “The virtue is in the middle,” in the mix of great neighborhoods and not-too-tall skyscrapers. Like anything else, skyscrapers are a good thing in moderation: Done right, they contribute to the vital mix of great cities. The sweet spot here is making sure that cities are neither too vertical and big nor too horizontal and flat. But the ultimate goal is to achieve the kind of density and mix of building heights that have long fueled urban creativity and powered innovation.